It seems Oscar Wilde wrote eight plays during his cut-short-by-scandal career as a playwright in 1890s London. I’m sure there has been more than that number of plays written about Wilde, his life and the scandal that caused his downfall. 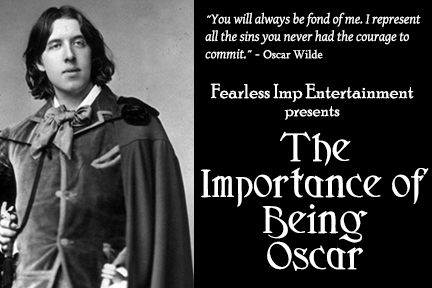 Brandie June’s new three-scene one-act, The Importance of Being Oscar, is making its debut at the Hollywood Fringe Festival in a production by Fearless Imp Entertainment. All the scenes are set in Wilde’s room at the Hotel d’Alsace after his release from prison and his subsequent self-exile in Paris. Longtime friend Frank Harris (Richard Lucas) visits him shortly after his expatriation in 1897. Harris encourages Wilde (Richard Abraham) to write, publish and earn an income. Wilde would seem to rather depend on the kindness of friends and plead debts to solicit spending money. 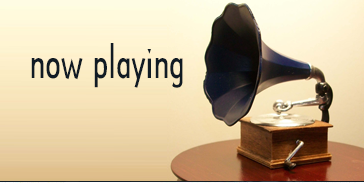 Harris is dismayed to learn that Wilde is still in contact with the cause of his problems, Lord Alfred Douglas. In 1898 Wilde’s estranged wife Constance (Cyanne McClairian) visits and offers Wilde a three-pounds-a-week stipend on the condition he never see Lord Douglas again. There is nothing new or especially noteworthy about either of these encounters. 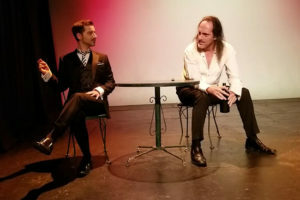 It is inspired when playwright June takes dramatic license and has a fevered Wilde on his death bed in 1900 visited by a figment of his imagination, his own immortal creation Dorian Gray (Patrick Censoplano in the play’s most vibrant characterization). The verbal volleying between these two masters of wit and depravity are the play’s highlights. With his foresight as a fictional character, Gray tells Wilde that his works will still be popular a hundred years after his death and the love that dared not speak his name will no longer be a crime. It might be interesting to see a work in which other of Wilde’s creations—Salome, Mrs. Arbuthnot, Robert Chiltern who were all accused of scandalous behavior—and even Algernon and Lady Bracknell take Wilde to task for his behavior but also offer him some encouragement and thanks for making them immortal.